Demonstrating the importance the company places on supporting its customers in all of its global markets, Dayco, a leading engine products and drive systems supplier for the automotive, industrial and aftermarket industries, has announced the launch of a dedicated web catalogue for Mexico and Central America. This latest development follows the introduction of its completely redesigned corporate and aftermarket websites, which were a central theme of Dayco’s presence at Automechanika Frankfurt in September and further endorses the company’s position as a leading global manufacturer of original equipment (OE) and aftermarket components. Emphasizing the breadth of Dayco’s product range in such an important region, the new web catalogue provides users with comprehensive coverage of more than 85% of the Mexican and Central American vehicle parc for power transmission components including belts, tensioners, idlers, dampers and water pumps. 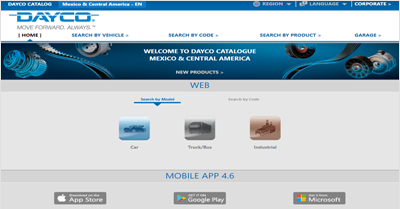 Reflecting the fact that digital platforms are fundamental to effective global interaction, in addition to the web-based catalogue, Dayco has also added the Mexican and Central American regions to its mobile catalogue app for smartphone and tablets, so ensuring the widest possible access, not only to the company’s OE quality products, but its helpful technical bulletins and service information. Finally, the region has been integrated into Dayco’s global aftermarket website, which now allows users to click on to the Mexican and Central American area and provides access to the full site, which, in addition to the catalogue, includes an overview of the company’s diverse range of products, as well as a comprehensive diagnostics section that allows users to identify problems and find the most appropriate repair solution. Commenting on these latest developments, Global Marketing & Communications Manager, Franca Pierobon said: “As a global brand with customers around the world, it is vital that we provide the correct level of aftermarket support, delivered in the most accessible format and tailored to be region-specific, in order for our customers to offer the best possible service to their own customers on a daily and ongoing basis.